To commemorate the centenary of the SAAC, the South African Post Office will issue a set of five stamps and a commemorative envelope. 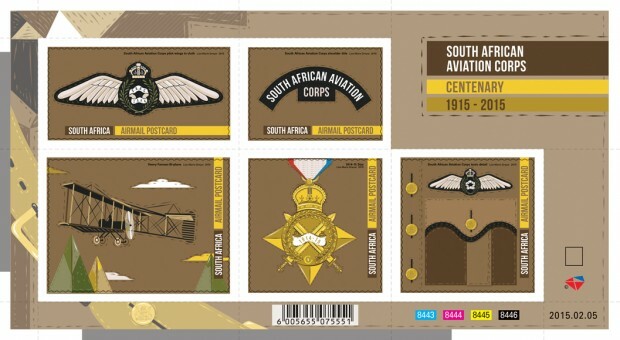 Designed by Lize-Marie Dreyer, the stamps depict the SAAC’s pilot wings, shoulder title, tunic detail, a Henry Farman bi-plane and the 1914-15 Star, respectively. History: The formation of the South African Aviation Corps (SAAC) dates back to a time when flying was still in its infancy. Growing into a formidable force, it played a major role in the South West Africa Campaign during World War I, and is considered to be the forerunner of the South African Air Force. Reminiscing about his experiences, Major-General van der Spuy recalls memories of those days “when flying was still in its infancy – a new form of sport and a great adventure – whether in war or otherwise… “To me it is now rather wonderful to be able to look back and wonder at the fact that notwithstanding the primitive type of aircraft we flew … we were able to demonstrate the effectiveness of aircraft as a military arm. We brought back information that could not have been obtained in any other way,” he added. The earliest roots of the South African Air Force can be traced back to the early 1900s when two men, Compton Patterson and Evelyn (Bok) Driver undertook two successful flights in a Bleriot Monoplane and a Patterson Biplane. These flights greatly stimulated public interest in the possibilities of powered flight. At the outbreak of the World War I, Mr. DH Cutlerowned a Curtiss seaplane and had the unique distinction of being the world’sonly one-man coastal command. He and his aircraft were commandeered by theBritish Admiralty to reconnoitre the South African coastline. The aircraft was transported by man-of-war to East Africa where Cutler spotted the GermanCruiser ‘Koenigberg’. As a result it was sunk and the defence authorities became aware of the potential striking power an active aviation corps would have in South West Africa (now Namibia). School who were recalled from Europe. The SAAC was gazetted as part of the Union Defence Force in terms of Government Notice 130 dated 29 January 1913 and officially published on 5 February 1915. The first operational reconnaissance flight of the German South West Africa Campaign was carried out on 6 May 1915. After a flight in one of the planes, Commander in Chief, General Louis Botha, who had previously depended on mounted men for reconnaissance, declared, “Now I can see for hundreds of miles.” The aircraft were also used on bombing raids and the South Africans were able to out-manoeuvre the Germans, leading to the Germans’ surrender three months later after the SAAC entered the campaign. The Corps was awarded the South West African battle honour, a unique award as battle honours are normally only awarded to units. The SAAC ceased to function as a separate unit from the end of the South West African campaign in October 1915, yet it was only officially disbanded in 1921. Members of the corps were incorporated into the Royal Flying Corps and formed 26 (South Africa) Squadron of the Royal Flying Corps. This squadron saw service in East Africa in support of South African forces under General Jan Smuts. The main task of the squadron was once again reconnaissance, but due to the dense bush and vegetation, it afforded the enemy virtually complete protection from aerial reconnaissance and bomb action, so all that the squadron could really do was report on the locations of towns, railways, roads and rivers. The squadron was disbanded in July 1918, before the end of the World War I.